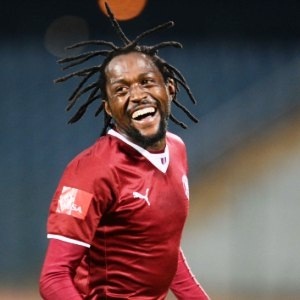 Johannesburg - A late strike by substitute Lerato Chabangu gave Moroka Swallows their first three points in 2015 when they overcame Free State Stars 2-1 at Dobsonville Stadium on Wednesday night. Both sides started the match with intensity as they moved forward, but it was the battle between defender Rudi Isaacs and Richard Henyekane which caught attention of the referee. In the 12th minute, the ‘Kimberley Express’ unleashed a shot but it was cleared off the goal line. However, a minute later, Shere Lekgothoane sent a cross over to find Luvhengo Mungomeni but his header went wide. Although the first-half didn’t produce enough chances to give either side a lead, Mungomeni’s cross in the 45th minute met Ashraf Hendricks, who could not trouble goalkeeper Johnny Mathole and headed to the left of net. Both sides headed to the tunnel tied on a goalless draw, but the second half saw the Bethlehem side finding the net when a header by Mbuyiselo Thethani hit the post and the ball landed in Moeketsi Sekola’s path – the striker slotted the ball home with his right foot. The hosts never gave up and surged forward in search of an equaliser, they were rewarded in the 70th minute when defender Hendricks headed the ball into the goal assisted by Larry Cohen to level matters. Swallows coach Fani Madida introduced Lerato Chabangu hoping that ‘All You Need Is Love’ would turn the tables for him and give him the first three points in 2015, and his gambling paid off in the 91st minute when Chabangu scored from a direct free-kick to seal the win for the home side. The win leaves Fani Madida’s men at position 15 with 22 points on the Absa Premiership log standings while Kinnah Phiri’s men drop to position 14, also with 22 points.